In honor of Age of Ultron coming out this weekend, I decided to write about my favorite Avenger, Dr. Bruce Banner. A withdrawn INTP, he may not seem to be everybody’s first choice. Without further ado, here are a few reasons why he should be your new favorite Avenger. Bruce is a far cry from the Hulk and this shows in the fact that he’s just plain nice and kind. At the start of The Avengers, he’s seen acting as a medical doctor in India. This is by no means a glamorous job and it’s obvious that he loves helping people. 3. He’s got his scars, just like the rest of us. Bruce was abused as a child. He was treated like a monster for a good chunk of his adult life. He's grown withdrawn and bitter because of this, but that doesn't take away from the fact this happens to all of us. He's a complex character and he's nowhere near perfect. But that's why I like him. 4. He’s best friends with Tony Stark. This dynamic duo has an epic bromance that has accurately been dubbed the Science Bros. Bruce puts up with Tony’s crazy awesome nonsense (and enjoys it!) and Tony brings Bruce out of his shell a little. Mutually beneficial, not to mention that they both really needed a friend. Bruce has no love of arguments and fighting. He will rarely jump into tension-filled conversations, unless he has a reason to do it or if he feels it’s absolutely necessary. But even though he is a peacemaker, if he feels what the group wants is wrong, he won’t just comply. He’ll speak up and make sure it doesn’t go wrong. It may be subtle, but he really does have a great sense of irony and humor. What about you? Is he your favorite Avenger too? What do you like about Bruce? What do you not like? Amanda is 17 and she likes editing, acting, reading and music. And potatoes. Mostly potatoes. He is, isn't he? He truly cares about people. It may be subtle and in his own way (he doesn't want to hurt them by getting too close), but he really does. He's such a sweet guy, but he's not nearly perfect. I agree with Sarah. 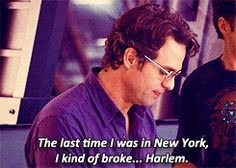 While I definitely loved Bruce & the Hulk for a long time (simply because he's a superhero & his 2008 movie was the first I watched of the MCU), I didn't appreciate him as much until Mark Ruffalo took over the role and his story become more prevalent in the MCU (come on, Marvel where's my 2nd Hulk movie. Ironman has 3, Thor & Cap each have 2. For the love of Stan Lee, ANT-MAN has a movie now). That being said, this post does Bruce justice and expresses every reason I do adore him. His wit is definitely high on "list of reasons everybody should love Bruce Banner." We NEED another Hulk movie. (Though I actually haven't seen the original one, because I saw Mark Ruffalo's performance first, and I don't want to ruin that. :P) Mark Ruffalo gave such depth to him and I really want to see that explored some more in a solo movie. It feels like the only reason they're not making one is because the first one wasn't a hit, but it would have a different cast now and people like Mark Ruffalo! *sighs* end rant. Great post! All great reasons to like Bruce. I think he's awesome! I'm glad you like him so much! He tends to be overshadowed by Tony and Cap a lot of the time, which is unfortunate, because I love his wit and intelligence. Agreed! I feel like Bruce gets overshadowed because he's so low-key and doesn't really like the spotlight, while you've also got people like Tony (who I adore, don't get me wrong) constantly demanding it. But I think the more people see of Bruce, the more they're starting to appreciate him. I was initially irritated that Edward Norton wasn't going to be playing him in the first Avengers movie, but then Ruffalo's version went on to kind of steal the movie in that gentle, mild way of his. I think one of my favourite things about Bruce is the fact that when you look at a list of his character traits on paper, he seems like he'd be out of place in a team like the Avengers--and that's what makes him such a great addition to the team. And I love that Bruce is so quiet and low-key. He really DOESN'T like the spotlight. Part of it is The Other Guy, but a lot of it is his personality. He's gentle and kind and just a really good guy. The thing I like about their team is that everyone has totally different personalities. Everybody uses their strengths in different ways. They do have their differences and they clash at times, but they understand being a team.